Using a VPN while browsing the internet is a great way to protect your identity and prevent your ISP from using your personal data and habits for their own benefits. However, setting up VPN clients all of your devices can be very tedious and even impossible with devices such as a Chromecast / Firestick. Also, some traffic might not be necessary to route over the VPN (gaming and other latency critical programs). A way to create a flexible VPNed network environment is to use VLANs to segment different network traffic. Properly configured VLANs will allow for outbound traffic of different segments to be routed to different VPN endpoints while allowing (or disallowing) normal internal routing between network segments. *To use VLANs, a managed switch is required. LAN shall provide a naked connection to the internet through the ISP gateway. WAN-bound traffic will be routed through a VPN endpoint hosted on a Digital Ocean Droplet. Traffic will be tagged with NO_WAN_EGRESS and be prevented from from leaving the default gateway. VLAN 10 traffic will be able to traverse all other network segments. WAN-bound traffic will be routed through a VPN endpoint by a 3rd Par. This network segment will be for general devices and Wifi users. Can only access VLAN 20 and LAN devices. Internet gateway will be a VPN high availability gateway group. Click the green '+' button to open the client configuration page. Follow the instructions provided by your VPN provider to add a node. (Optional) Repeat the last step with as many nodes as you like if you plan on using a Gateway group for high availability. Click the green '+' button to open the VLAN configuration page. The Parent Interface should be the LAN port. Can access all other network segments. Internet gateway will be a privately hosted VPN on Digital Ocean. Refer to your switches configuration instructions for VLAN configuration. This configuration uses a TP-Link (TL-SG108E). They can be found for $30 and are fully manageable from a web interface. Choose a port on the switch to be the trunk. It will connect all of the VLAN traffic back to the router. Select 'Tagged' for that port on each VLAN you will be using. Select 'Untagged' for each port that will be connected to a device with traffic on the selected VLAN. Create new interfaces using the VLANs that were created earlier by selecting them from the drop down and clicking the green '+' button. Click on the name of the newly create interface or select it from the interface drop down on the top ribbon. Leave the IPv4 Configuration Type set to DHCP. The IPv4 address will be set by the VPN server. Create new interfaces using the VPN clients that were setup earlier by selecting them from the drop down and clicking the green '+' button. Set the IPv4 Configuration Type to Static. Set an IPv4 Address segment. This segment will be used by all the devices on the VLAN. 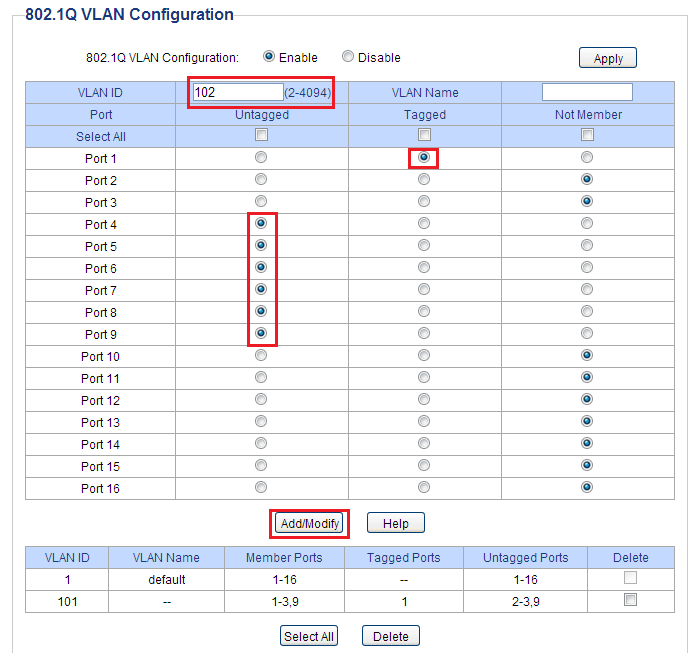 Select a tab matching one of the VLAN interfaces. Set the DHCP Lease Range for the devices on the network segment. If desired, Unique DNS servers can be set to under the server section. If left blank, It will use the default DNS servers pfSense is assigned. Repeat these steps for all of the VLANs created. If multiple VPN clients have been created, they can be assigned to a gateway group. By doing this, if one VPN client stops working, traffic assigned to the gateway group will fail over to a different client. Click the green '+' button to open the Gateway Group configuration page. - Give the Group a name. Set the Tiers of the VPN gateways to be used in the group to Tier 1 (this will create a round robin usage). If one is set to Tier 1 and another is set to Tier 2, The Tier 2 gateway will only be used when The Tier 1 Gateway fails. Add a set of outbound mapping for each VPN Interface created with the source being the network segment of the associated VLAN. Along the top are tabs for each interface that has been created. For each interface assigned to a VPN client, create a rule that passes all traffic. For each interface assigned to a VLAN, groups of rules will need to be created to direct the flow of traffic. To allow traffic to be able to access other segments, a passing rule must be created to direct the traffic to use the routers default gateway or else it will try and use the VPN for local address. This will tag the packet that matches the rule and can be filtered out with a floating rule. Select the "Floating" Tab at the top of the Rules page. Any device attached to a port assigned to VPN will use the VPN Gateway Group to access the internet. Attaching a Wifi Access Point to a port assigned to the VPN VLAN will serve all of the connected devices from the VPN Gateway. Using VLANs to segment networks and traffic is a great way to implement different routing rules and traffic needs, especially when using a router that has limited physical ports.